European Schools in Brussels are failing to accommodate the needs of children with disabilities, according to a new report - with one mother describing the school's approach as "sink or swim". The study, by Human Rights Watch and the European Disability Forum, found that children with special needs were "rejected, pressured into changing schools, or not provided with appropriate support to allow them to learn and thrive". The report, based on interviews with pupils, parents and staff, coincides with a biannual meeting of the European Schools' board of governors this week, which will discuss inclusive education. 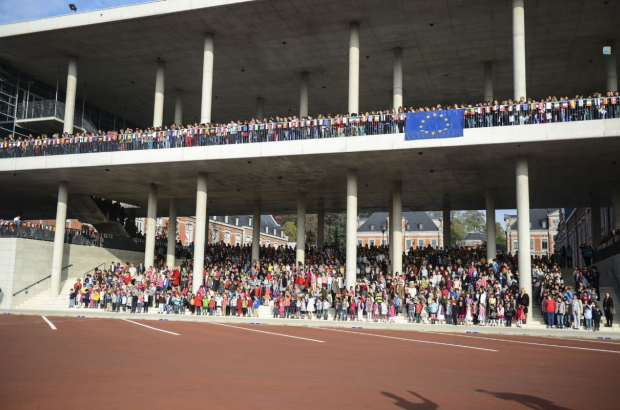 There are 13 European Schools, primarily catering for children of EU staff, in Belgium, Luxembourg, Germany, Spain, the Netherlands and Italy. Between them they serve 27,000 children - of whom 4% are on record as having special educational needs. The UN Convention on the Rights of Persons with Disabilities guarantees children with disabilities the right to inclusive education, including adapted teaching methods, assistive technology, and alternative exam formats. But some of the parents interviewed in the report said they felt pressured to move their children to another school. Some parents said school staff would repeatedly call them in to complain about their child's behaviour or academic performance. One 15-year-old girl with dyslexia, who left the European School system after struggling for years, said: "This school was like an ant-hill. Every year they filtered the best to keep only the elite. Those who are a little defective, they do everything they can to reject them. They wanted us to feel bad enough to leave on our own." Lea Labaki, from Human Rights Watch, said: "How can EU institutions claim to promote inclusion and diversity, if the needs of children of their own employees aren’t being met? At the very heart of the European project, the European School system is not providing children with disabilities the fully inclusive education they are entitled to." According to the report, the European institutions pay for about 70 children with disabilities - whose needs cannot be adequately met by a European School - to be taught at a private school instead, at a total cost of €1.5 million. Yannis Vardakastanis, president of the European Disability Forum, said: "While over the years some improvements have been made, the fate of students with disabilities is still concerning. We want the European School system to be a great example for Europe, promoting diversity in all its forms, and ensuring inclusive education to all students with disabilities." So this report simply confirms what has been evident for at least thirty years. It shows that the problem has been ignored for over 30 years. This isn't new and everybody knows about it.